Hurricane Harvey was one of 17 named storms to batter the US last year. 2017 was characterized by extreme weather. Seventeen named storms – including Harvey and Irma – battered the US, costing a record $200 billion in damages. Monsoon flooding devastated parts of India, Bangladesh and Nepal, killing over 1,200 people and affecting 40 million. From flooding to wildfires, hurricanes to droughts – our world has become a more unpredictable place to live and work. Indeed, this year’s Global Risks Report puts a spotlight on the environment. 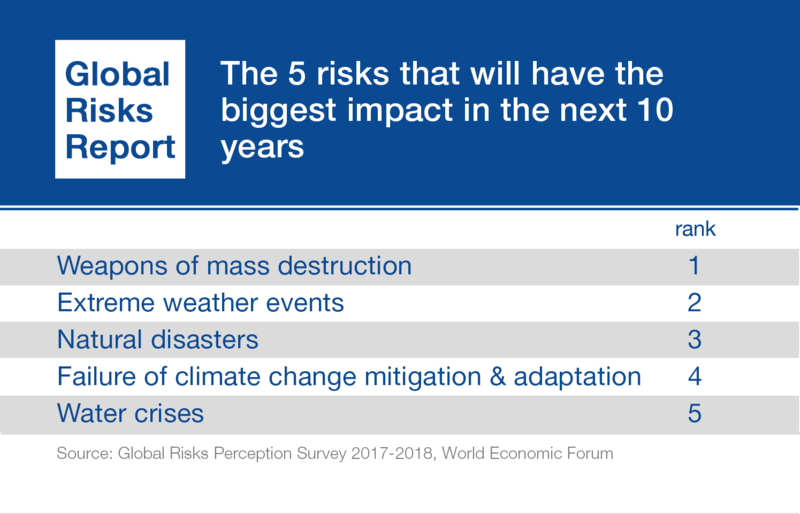 Four of the top five risks in terms of impact are environmental, and all have a higher-than-average likelihood of occurrence. Worryingly, these risks are now tangibly affecting human wellbeing, including our health and economic prosperity. Building a shared future that better predicts extreme risks and fosters the resilience needed to mitigate their effects is essential. So too is our ability to reduce greenhouse gas emissions, which cause atmospheric warming and fuel more powerful storms, floods and droughts. Many of the solutions to these challenges already exist, but implementing them is complicated and challenging. This year’s official programme in Davos focuses on cultivating the foresight, leadership and action plans needed to meet the needs of people within the means of the planet. A window of opportunity to ramp up efforts before 2020 could yield significant future benefits, with the implementation of the Paris climate accord, and new agendas being defined for oceans, forests and biodiversity. Technology will play an increasing role to scale impact fast. If you’d like to keep an eye on the Davos agenda as it unfolds, with our biggest environmental programme to date, here are some of the principle themes for this year’s meeting and the top sessions you can watch online. You can also follow the World Economic Forum – Environment Facebook page. ⦁ A Sprint to 2020 – How can emerging market leadership drive action on the sustainable development and climate agenda in the lead up to 2020? ⦁ From Growth to Prosperity – How do we meet the needs of all within the means of the planet? ⦁ Investing for Impact – How do we unlock private capital to scale social and environmental impact and accelerate progress on the Sustainable Development Goals? ⦁ The 21st Century Social Compact – How can corporate management, boards and investors align to support long-term value creation? ⦁ Hope for Elephants – What are some emerging approaches to protecting our gentle giants? ⦁ The Great Energy Transformation – How can leaders move beyond political hurdles to create a clean, affordable and secure energy future? ⦁ Stepping Up Climate Action – How can leaders seize today’s opportunity and ratchet up their efforts? ⦁ The Belt and Road Impact – What are the implications of China’s Belt and Road Initiative for regional collaboration and the expansion of clean infrastructure? ⦁ Strategic Outlook: Energy Systems – How will industries, institutions and innovation shape the future of energy systems? ⦁ A New Era for Energy Politics – Who are the new players poised to control the resource politics of the future? ⦁ Responding to Extreme Environmental Risks – How can countries and communities mitigate risk and build long-term resilience? ⦁ Future Shocks: Rogue Technology – What if technology was used to annihilate plants and animals that underpin ecosystems and our global food security? ⦁ The Global Economic Outlook – What lies ahead for the global economy in 2018? ⦁ New Consumption Frontiers – How are retail and consumer industries reinventing waste as a resource? ⦁ Bio-Inspired Innovation Unleashed – What if the DNA of all life on Earth was entered into a database we could mine for new medicines, fuels and other breakthroughs? ⦁ On the Menu: Sustainable and Nutritious Food – What is needed to propel a sustainable and nutritious food revolution? ⦁ Geospatial Technology Unleashed: How can geospatial technology be harnessed to better inform the lives we live, the decisions we make and the impact we have on our planet?